A Community Resource for Protecting Children and Preventing Child Abuse. 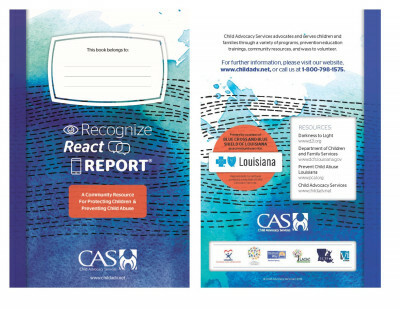 Child Advocacy Services is proud to share the newly revised and redesigned Recognize, React, Report resource. This is a community resource for protecting children and preventing child abuse. This resource was originally designed because people often witness child abuse and neglect but do not understand their responsibility in reacting to the incident or making a report. Also, children themselves have a difficult time expressing concerns or understanding abuse. The interactive design makes this an excellent resource for adults and children to review together. The newly revised resource has been updated to include information on keeping kids safe in a digital world as well the 5 Steps to Protecting our Children. To request more information or copies of Recognize, React, Report, contact Lauren at lreynolds@childadv.net. Darkness to Light Stewards of Children has developed the 5 Steps to Protecting our Children. This is a guide to help adults be responsible in preventing, recognizing, and reacting responsibly to child sexual abuse. It gives simple, proactive steps to help protect children. A child's safety is an adult's job. Children are often taught how to keep themselves safe from sexual abuse - and that's important for them to learn - but it's no substitute for adult responsibility. We make sure children wear seat belts. We walk them across busy streets. We store toxic household cleaners out of reach. Why, then, would we leave the job of preventing child sexual abuse solely to children? Imagine how difficult it is for a child to say "no" to a parent, a teacher, a coach, or clergy. The guide also contains information for adults that can help them talk to children about recognizing and preventing child abuse and neglect in the community. It offers topics that you can talk about with your children while working on the activity section together. The guide also gives you facts about reporting child abuse. It is everyone's right and responsibility to report child abuse. Tips are included to help know what information should be provided when reporting child abuse and neglect. Any information that you can provide can be helpful to a child's safety. You can't afford to ignore sexual abuse. Protect their only childhood. The activities in Recognize, Report, React will help you to talk to children about the different types of abuse. It also gives you the opportunity to discuss who the child can talk to that they trust. Our most sincere thanks to Blue Cross Blue Shield of Louisiana as a corporate sponsor for their continued support for this project. For information on how to obtain this resource for distribution, please call 800.798.1575.